Pre-packaged all-in-one deployable Thermal Angel Blood and IV Fluid Warmer system that is specifically designed to address the unique needs (weight, size and space restrictions) of today’s combat medic personnel. Contains two separate modules that attach together (Velcro) or can be individually carried. Ultra Operations Module (TA-UOM) comes with a visual assembly guide for simple setup. Module to deploy far-forward. Includes all necessary components to respond to a single patient's fluid warming needs. 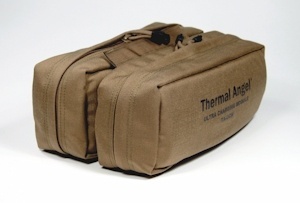 *Thermal Angel Disposable Components required for module "re-load" after each patient use. Module to charge the Ultra Battery 1 from a variety of power sources (AC and DC). All components are reusable.